As the the year comes to close, I wish everyone a Happy New Year! 2005 has been kind to me and I hope it was the same for you. I look forward to 2006 and pray that it will be a great year if not greater than 2005. Each new year brings us hope and opportunity that better things will be in the horizon. May God bless us all. Here’s looking towards a fantastic 2006! 2005 is coming to a close and it’s that time of the year to reflect on the the year that was and examine the blessings that have been given. To be honest, at the onset of 2005 I felt sad and wasn’t really looking forward to it. Why? Well, December 2004 I found out that a project that we were working on will be cut short. For what reasons I don’t want to speculate anymore. It was sad because I really enjoyed working with the people on the team. People I really respect. Apart from that I was making good money with the project which afforded me a chance to own one of my dream gadgets, a Powerbook. So 2004 didn’t close all that well with the loss of that job. In January 2005, I was at a assembly. My friend gave a talk and I remember her saying that while 2004 was great, 2005 promises to be even greater. With her words in my mind, I started to be hopefull that 2005 would be great. You know what? It did turn out great. Not exactly what I had in mind but fantastic nonetheless. Let me recap the highlights of 2005. 1. *Various speaking engagements* – I was fortunate enough to start out the year with some speaking engagements. I’ve always made it a point to accept speaking engagements because it provides me a venue to share my message across. I’m also flattered that people actually want to listen to what I have to say. In January I had the chance to talk at a major event called “Pinoy Unleashed” produced by Unleash International. This was an event to launch a programe that they have. It was also aimed to inspire people to maximize their potentials and become better persons. Believe it or not I was in the company of very important and successful people such as Tony Tan Caktiong, founder and chairman of Jollibee, the number 1 fast food chain in the Philippines. and many other distinguished men and women who spoke at the event. In relation to that I was also invited to talk at Jollibee’s annual convention on February. I was happy to have gotten a chance to be part of that event. I saw why Jollibee is considered as one of the best company’s to work for in the Philippines. For a second year in a row I was also a speaker at the LEAP Congress. An event put together by Innerwheel Club of Makati North. The goal of the event is to inspire the youth to become leaders. Apart from this three major events I was also fortunate enough to speak for CLPs of Singles For Christ. This has been something I’ve been doing regularly for the past few years. A way of serving God and giving back to the community. 2. *Sparkplug Studios* – In June 2005, we transitioned to a new company that I, together with my brother and some other friends put up. It’s a design company that focuses on Web and Graphic design. We also plan to focus on User Experience. I’m very happy with the birth of our new company, especially because it gives me an opportunity to work with my brother and becoming an entrepreneur. 3. *Distinguished Alumni Award* – My alma matter, DLSU-College of Saint Benilde bestowed upon me the honor of being the first ever recipient of the Distinguished Alumni Award. This came as a total surprise to me. There are a lot of other qualified candidates for this award but somehow they chose to give it to me. I am forever indebted to my school for provideing me an education and for accommodating my special circumstance. I am what I am today in part because of my school. 4. *Writing for MPH* – This year I fulfilled one of my dreams of writing on a much more regular basis. I’d like to thank the people behind MPH Magazine, a local mobile tech magazine for providing me the opportunity to write for them. It has truly been a wonderful experience. 5. *Myozyme* – The biggest blessing this year came at the very end. A photo finish of sorts. On Dec. 20, 2005 I was given my first infusion of Myozyme. The enzyme replacement therapy being developed by Genzyme for Pompe patients. This is indeed a blessing. It’s something that I’ve been waiting for 18 years. I’m thankful to the people at Genzyme, the doctors at the UP-NIH for putting this together and giving me a chance at a better life. Apart from these major events this past year, there have also been other blessings this year. Such as the chance to develop new friendships. I’m thankful for the new people I met at PhilMUG, whom have been so warm and welcoming. The people from DLSU-CSB, Kato, Chong and the rest.. Jeri, Kevin’s assistant, I’m happy to have met you even if it’s just online. I’m also thankful for developing friendships from people I’ve known before but didn’t really have the chance to get to know them well till now. Peopls such as Tiffany, Cricket, Nikki, Jayvee and Kevin. I am also grateful for the continuing friendships that I have. There are too many to mention but you guys know who you are. My life is better with you in it. I am thankful for my family. Their continuing presense, love and support make my life, the great one that it is. Sure there are many challenges. It’s a difficult life especially dealing with Pompe but my family, friends and colleagues make it a worthwhile life to live. Most of all I am thankful for God’s continuing love. He has always been there for me and has never left my side. He has given me a lot of gifts. I am blessed. As 2006 approaches, I am thankful for the year that was. I’m also looking forward to the year that will be. With Myozyme, I am hoping that a better future is in store. I am praying for more opportunities to share my blessings with other people. There’s exciting things in store for 2006. I was lying in bed one night and for some reason I remembered Jose. A fellow Pompe patient, I was privileged enough to get to know Jose through the GSDnet mailing list. He’s one of the good fellow’s who’s always generous with his advice and opinion. Although I haven’t met Jose in person, I still felt like I lost a friend. There’s a certain kinship I guess with fellow Pompe patients. Jose shared his life with fellow Pompe patients and so in a sense I felt like I knew him well. I’m lucky that I have a lot of people around me. Still the fear is there. Sometimes I lie in bed and find myself thinking that what if my machine failed and no one is there… I soon find my heart racing because of the thought. I guess this is something I together with other Pompe patients have to live with. While I have this fear, I try not to let it take over my life. I take the precautions in order to prevent it but at the same time I try to live my life as normal as I can. Jose, if you’re reading this. I’m thinking of you buddy… I hope you’re happy up there and Pompe free. I’ll see you up there but hopefully not for a long time… I still have a fight down here and I don’t intend to give up anytime soon. It’s Christmas time once again. I just want to wish all a merry, merry Christmas. Let’s not forget the true meaning of this holiday. It’s the day that our saviour Jesus Christ was born. A truly wonderful gift that God has bestowed on us. Let us remember Christ’s birth as we celebrate this holiday. More than the gifts, celebrations and other things.. Let us remember that the true essence of this holiday is love. Celebrating the love that God has for us. Let’s also celebrate our love for each other. I hope that this year has been great for you. I hope that you have been blessed as much as I and my family have, if not more. From my family to yours, a truly merry CHRISTmas! What Would You Tell Other Pompe Patients? In a recent phone conversation with new friends of mine, I was asked the question “What would you tell other pompe patients?”. The question mostly pertained to newly diagnosed patients but I think it also applies to all patients. Well here’s what I would tell them. The first step to solving a problem is acknowledging the problem. In this case it’s Pompe. A patient must really learn to accept his diagnosis. There’s no sense running away from it. It’s not a problem we can run away from. The sooner we accept it, the sooner we can deal with it. The next step would be education. Try and find out as much as you can about Pompe. Browse the web sites, seek help from professionals, talk to other patients and your family about it. The more you know about it, the better. There are things you can do to try and slow the progression until the time comes that you can receive ERT. Now comes the time to channel your energies to the positive aspects of your life. Never under estimate the power of positive thinking. A positive attitude is key to having a better life. Don’t let Pompe define your life. It’s not who you are. It’s just a part of your life. It doesn’t define your being. Use this situation as a chance to do something great. There are lessons to be learned in dealing with Pompe. Use those lessons to help improve your life. Use it as a chance to bring your family and friends closer together. The biggest lesson Pompe taught me is to value the simple things in life. Often times, the simple things are the important ones. Such as spending time with family, appreciating the world around you, being thankful for what you have, etc..
Focus on the things that you have and not on the things that you’ve lost. There’s no sense in dwelling on the things you’ve lost. Aa the saying goes, “Don’t cry over spilt milk”. Finally, whatever the end holds for us is not as important as the journey we took to get there. In the end I might lose to the fight against pompe, or I might win. I honestly can’t say until I reach the end. What I do know is that the journey is more importnant than the destination. As long as I gave it my all, lived my life to the fullest, I can’t lose. Others can do this as well. So that’s my message. What do you think? It’s been several days since I got out of the hospital for my first infusion. I’ve had time to really think about what has happened. I really didn’t want to think about it till the infusion actually pushed through. Now that it has, I’ve reflected on the implications that it will have on my life. I really don’t know to what extent Myozyme will have an effect on me. All I can do is hope for the best and give it my all and we’ll see how it turns out. I fully understand that Myozyme won’t be the answer all by itself. I need to put a lot of work along with it. Work such as physical therapy, proper diet, adequate rest, etc.. All of these together will hopefully give me the best result that is possible. Of course above all that is the faith that God is with me and that if he wills it, I will get better. Now therein lies the problem. All of those I mentioned above will require a shift in how I live me life. Prior to this I basically just worked and health really took a back seat. I needed to work because that’s the way it is here where I live. Life is hard and everyone needs to work to get by. While my family supports me, I can’t just rely on them. I need to do my part. I’m starting to think of ways on how I can devote my time more to getting better. I’m thinking of trying to devote the coming year 2006, to putting more emphasis on health rather than work. This means I might have to take a break from work. It’s good that I partly own the business I have together with my partners but then again it’s not a big business and I’m not sure if I can afford to give up my job. Since getting better has its expenses. I don’t want to be a “burden” to my family and have them shoulder everything. They’ve really sacrificed enough. So….. what to do, what to do?!? I’m still in limbo. I need to find a solution to this. Any ideas?!? If you do, please let me know. What I’m sure of, is that health has to come first. I really need to put effort into this or Myozyme will just be wasted on me. I don’t want that to happen. Not when a lot of people have put in good effort to bring Myozyme to reality. I hope 2006 will be a good one. If 2005 is any indication, the next year promises to be great. I’m really looking forward to seeing how it turns out. I was anticipating that Monday would be the start of my very monumental journey towards turning the Fight vs. Pompe for the better. I did not expect though that this is how it would turn out. As of the prior weekend the release of the enzyme was still in limbo. The freight forwarders that were handling the importation of the medicine said that the papers were still being processed. My mom called their office and ask what we could do to speed things up. They said that they’ll try their best and to call them up on Monday for an update. Ok, back to Monday. My mom called the freight forwarder Monday morning to follow up on the release of the enzyme. This time they said that they’re committing to delivering the enzyme at 5 p.m. that afternoon. They were confident that they could deliver. Enough to promise a guarantee. My mom called the hospital that same morning to check if there was a room available already. The hospital said that they were holding a room for us but we needed to check in by 2:00 p.m. Upon hearing the good news my mom came into my room and excitedly told me that I needed to get ready. We needed to get to the hospital before 2:00 p.m. Now for someone like me, it takes quite awhile to get ready. So i tried to hurry things up as much as I can with the help of my aide. I finished taking a bath, dressing up and packing at around 11:00 a.m. We needed to leave the house no later than 12:30 p.m. I had an hour and a half to kill so I spent that time preparing some stuff at work as well as sending a few emails. We left at 12:30 on the dot. The trip to the hospital was a relatively quick one. We got to the hospital at around 1:30 p.m. My mom and dad went down ahead to see if everything was in order. PGH, the hospital where the infusion was to take place at is a public hospital. As such we weren’t very oriented on how things were done. Since we were accustomed to going to a private hospital near our home. Public hospitals here in the Philippines are really severely under funded and over booked/worked. PGH is not exempted to that, even if it is the biggest public hospital in our country. I’ll reserve my observations about the hospital for a different time. We were doing this at PGH because this is where the UP National Institute of Human Genetics is connected. They are the ones who are leading the research and treatment for Genetic disorders here in the Philippines. Dr. Sylvia Estrada met my parents at the admission section of the hospital and assisted them in the arrangements for my stay. Luckily there was a “pay ward” or a private wing of the hospital wherein patients can get private rooms. We got a room at that wing of the hospital. By 2:30 p.m I was already checked-in and was in the hospital room together with my parents. The actual infusion was going to be done on Tuesday morning but we decided to go a day before just to make sure we had allowance for additional tests if necessary. True enough we needed to do one last blood test. The pulmonologist on the team wanted an ABG test done to be sure that my blood gas levels were acceptable prior to the start of the treatment. We spend Monday afternoon and evening at the hospital room. I had several guests that afternoon and early evening. Some people from my dad’s office who also happened to be at PGH stopped by. My uncle also came early evening to wish me well since he could not make it on the day of the infusion. At somewhere around 2 or 3 in the morning the phone rang in my hospital room. Someone called and asked if he could speak to the relatives of the dead. It was my aide who answered the phone but told me about it. I thought, “What the?!? !” Was this a sign of things to come? That added to my already anxious and nervous state. I didn’t get to sleep that much during the night. Thinking about what was going to happen in several hours as well as the occasional monitoring done by the nurses. By 6:00 am I was getting ready for the infusion since we were scheduled to start the infusion at around 8 a.m. However we got into a slight delay. I won’t elaborate on it anymore since I’d like to focus more on the positive aspect of the day. Suffice to say we were able to get back on track at around 10 to 11 a.m.
My friend, who’s a professional photographer came by to take pictures of the infusion although he had to leave at around 11 a.m. since he had to go back to the office. He wasn’t able to take pictures of the actual infusion since he only got time off for a few hours and because of the delay, he ran out of time. In hindsight everything was for the best. Some of the important people in my life were able to make for the start of the infusion. My grandmother came in the nick of time at around 12 noon. By 1 p.m. we were good to go. The I.V. needle was stuck in my arm already and the enzyme was connected to the infusion pump. 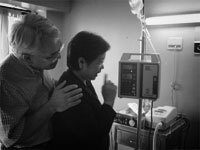 We started the infusion with a prayer led by my aunt. I specifically asked that we say a prayer before we started. After the prayer I said a simple thank you to my family, doctors and friends who came to share the monumental experience with me. After a few words, my mom ceremoniously pushed the start button on the infusion pump. After the enzyme started dripping the room was filled with cheers, tears and expressions of happiness. The room was also drowned by the sound of “Hallelujah from Messiah” by G.F. Handel. My mom also brought some balloons to make the occasion a bit livelier. The whole infusion took around 4 hours. The lead doctor and her assistant stayed in the room to monitor my progress throughout the infusion. Apart from the initial elevation of my blood pressure everything else was fine. I attribute this to nervousness. By 5 p.m. we were done. All that was left to do was observe me overnight and see if I have any reactions to the enzyme. The doctors weren’t expecting anything to happen. They said, they were more worried with the next few infusions since the body has had the chance to create anti-bodies. I slept relatively well that night sans the occasional interruption by the night duty nurse to take my blood pressure and check other vital signs. I woke up at around 6:30 a.m. raring to go home. As much as I’m happy that we’ve started the infusion I couldn’t wait to go home. Several days without my Powerbook and the internet was starting to get to me. I was restless already and wanted to go back to the comforts of my own home. Some of the doctors came by over the next few hours to give me a final check-up before processing my discharge orders. My dad and mom arrived around 9 a.m. along with my dad’s good friend who flew all the way from Indonesia just to visit and wish me well. We spent the morning chatting and killing time since the hospital could only fix our discharge papers at 11 a.m.
By 12 noon we were out of the hospital and on the way back home. The above is a condensed account of my experience. Some of the details I intentionally left out. One because I’m still a bit tired and two I’d like to keep some of them private for personal and other reasons. emotionally, physically and financially but they don’t complain. I’d like to thank the great team of doctors who made this possible, my friends for the prayers and support and Genzyme for giving me a chance to improve my life. I’m taking this experience one step at a time. I don’t know how the treatment will affect me. All I can do is try my best and see how it turns out. In the end it’s really all about giving it a go. Well… not a real one! But a great one nevertheless. In more ways it’s better than the real thing. I got home last monday feeling a bit bad. I was tired from a visit to the doctors office. For some reason I wasn’t really feeling well. I get tired easily these days. Upon arriving home, I opened my email to check for new messages. I got an email from a Dr. friend. The message read “This morning my sister delivered to your apartment a package. It is from the 3 of us…” referring to some colleagues of her. I asked the people at home if there was a package for me. There was! I received a gift with a card. 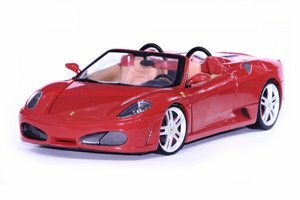 I opened the card and the message went something like.. “We couldn’t afford to give you the real thing…” I then went on to open the gift… Inside was a Ferrari F430 diecase model by Hot Wheels. Wow! There are two material things that I’m passionate about, Ferrari and Apple Computers. I collect Ferrari model cars since I can’t afford the real thing. Not that I have a huge collection. I think I have 5 or 6 but I do love’em. I was really touched by the gift. In fact I think the model car is indeed better than the real thing. Why? At a local cost of somewhere around 17 million pesos or a little over 300,000 dollars that money is best used for something else. Like getting medicine for sick people. Even if I had that much money I’d probably settle for a simpler car and just use the money for something else. Don’t get me wrong I love Ferrari’s in fact I’ve even fulfilled my dream this year to ride one but I don’t think I’ll ever own one. So in many ways the model car is just perfect. Plus it’s really the thought that counts. I asked my Dr. friend who she found out I like Ferrari’s. She mentioned that on a visit to my house, I mentioned in passing that I liked Ferrari. She never forgot. Awww…… Sniff.. sniff..
Why is this related to Pompe? Well she works with the company making the ERT. Plus more than that, it was because of Pompe that I got a chance to meet her and her colleagues. I’ve gotten to meet a lot of great people because of Pompe. For that I am blessed. Part of creating awareness for Pompe disease is getting to know the actual people suffering from it such as myself. I feel that if I only present clinical facts, symptoms or whatnots it wouldn’t really make that much of an impact on people. So with your indulgence, allow me to share a bit of myself. Get the know the human side of a Pompe patient. In time I will also try to get some other patients to share a part of their lives with you. But it has to start with me. As the saying goes.. “lead by example”. My name is Juan B.K. Magdaraog. Most of my friends and family call me by my nickname Dickoy. Don’t ask me why my parents named me that. I did however get used to over the years. It’s a funny sounding name but a memorable one nonetheless since it’s not so common. I’m a full time creative director for a small company called Sparkplug Studios that I, together with my brother and some friends own. I started out as a web/graphic designer before wearing the creative director hat. But since we’re a very small company I still do web and graphic work at the same time. You must wonder why a creative director/designer uses Blogger for his blog.. Well putting simply I just didn’t have time to design and implement a custom blog. I wanted to get this project started. In time I’ll move this blog to my server and implement a custom design. For now this will suffice. Do I love what I do now? Well I learned to love it. It wasn’t what I had in mind when I was a child. I wanted to become an architect or a lawyer. But since Pompe disease placed me in a unique situation, I had to shift to things I can physically do. Technology has allowed me to work in a virtual world wherein physical strength while it still plays a role can be circumvented by technology. Through the use of computers , I am able to be productive in ways that I would have never thought possible. Apart from my day job I am a sometimes writer… Meaning I write sometimes… 🙂 Every now and then I get a chance to write for a local publication called mph (mobile philippines). A gadget oriented magazine catering to the local market. I also had a chance to write for a book called Reflections From A Different Journery. I’m happy to have the chance to write. I can’t say I’m a particularly good writer. I write because I have something to say. Whether or not it turns out to be eloquent, well that’s another story. Apart from the above mentioned one of my bigger passions is being a “ThisAbility” advocate. ThisAbility is a term I coined up to put a positive spin on having a disability. I’ll go into more detail about ThisAbility. Suffice to say that this is something I wish I could do on a full time basis. Unfortunately one has to earn a living. If I win the lottery, you can be assured that this is something I’ll do full time. Being a ThisAbility advocate means going around and talking to people about the positive side of having a disability. Explaining to people that even if a person has a disability, he/she can still be productive and live a meaningful life. It’s basically anchored on the principle of looking at the brighter side of life. The power of positive thinking. I’m also like your average 20 something guy. I like going out with friends, although it’s becoming increasingly rare these days. I like movies, music and watching tv. I love all things Apple. I simply adore my Powerbook. I also love Ferrari. I love the cars, I love the formula 1 team. Two people I’d like to meet is Steve Jobs and Michael Schumacher. I only have one dream that I would die for.. That’s to have a family of my own. I grew up in a very loving and caring family. I’ve seen how it is to have people around you who love you unconditionally. That’s something I eventually want to have. But if life has something else planned for me I’d have to accept that. Well… that’s all I can think of now.. If you want to know anything more.. drop me a comment and I’ll try to answer your questions as much as possible. Thanks for stopping by. Fight Pompe!